Three months ago Robert and Griffin brought their unborn baby a Chick-Fil-A outfit with “little nugget” on the front, completely unaware of how much of an intricate role Chick-Fil-A would play in the birth of their daughter. On Tuesday night Fallon Griffin began to have intense contractions, so the Griffins packed up their family and headed to the hospital. Along the way, they stopped at a San Antonio, Texas Chick-Fil-A in order to drop their two older daughters off with a family friend. When they got to the Chick-Fil-A, Falon needed to use the restroom, so a nice Chick-Fil-A employee let them into the already closed restaurant. While Falon used the restroom, Robert met with their family friends and quickly loaded his daughters into their car. When he finished he went to go get his wife from the restaurant, only to be met by an employee who said that his wife started screaming. “I’m about to dial 911, I open the door and she’s just screaming,” Brenda Enriquez, the Chick-fil-A store director, said. “Sweetie, we are gonna have to do this right here, right now,” Robert said to his wife while calling to the Chick-Fil-A manager, telling them to call 911 and to bring him towels. Robert added that he didn’t want to make his wife nervous, so he just told her to relax while he got the baby out. 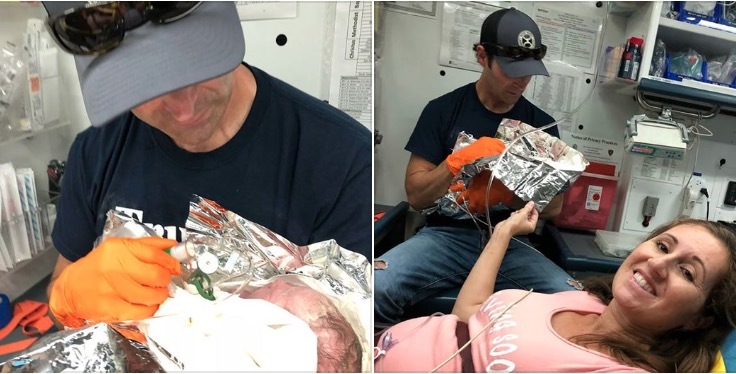 The Griffins had been on speakerphone with first responders while they were on their way to the Chick-Fil-A, but the Griffins even cut the umbilical chord before they even arrived. In his Facebook post, Robert shared which t-shirt he used to deliver his daughter: a Trump 2020 shirt. In traditional “not all heroes wear capes” fashion, Chick-Fil-A employees warmed up towels in order to keep the baby warm until the first responders arrived. “All I cared about at the end of the day was the baby was breathing, and by the time they (first responders) arrived, she was pink, thankfully for those blankets for keeping her warm,” Falon told KSAT-TV. Even though the pregnancy was high risk for both the baby and the mom, they are both now doing great. In typical Chick-Fil-A fashion, the chain is giving the baby food for life as well as a guaranteed job when she turns 14 years old.